The extent to which tax policies influence the amount of labour that private households supply has been at the centre of many public policy debates. Within married couples, joint versus separate taxation may be one factor that contributes to differences in household labour supply. This column uses a model that closely reproduces the changes in married women’s labour supply in the US and Europe between the early 1980s and 2016 to show that taxes are indeed a major factor shaping the labour supply of married women. How much influence do tax policies have on the labour supply behaviour of private households? This question is not only at the centre of many public policy debates, but also the focus of a large macroeconomic literature that evaluates the role of taxes in understanding the time-series changes in labour supply. Prescott (2004), Ohanian et al. 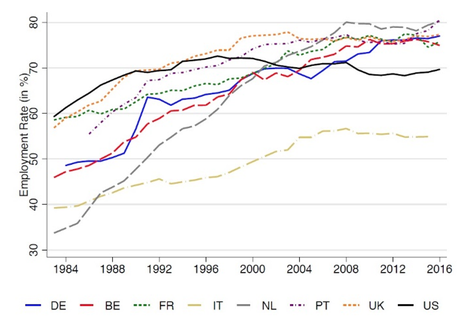 (2008), and McDaniel (2011) show that differences in the evolution of consumption and average income tax rates can largely explain differences in the time-series of aggregate hours worked across European countries and the US between the 1950s and today. In a recent paper (Bick et al. 2018a), we provide new facts and evidence for how changes in taxation shaped the time-series of married couples’ labour supply. Married couples constitute on average two-thirdsof households aged 25 to 54 and are thus an important group to study. We exploited the dataset developed in Bick et al. (2018b) to examine the hours worked by married men and married women over time. Our sample covers the US, the four largest European economies (Germany, the UK, France, and Italy), as well as Belgium, the Netherlands, and Portugal, from the early 1980s to 2016. While married men’s hours worked were largely flat or slightly falling over the last few decades, married women’s labour supply increased dramatically: in our sample countries, average hours worked by married women rose by 330 hours on average between the early 1980s and 2016 – as opposed to only 50 hours for their unmarried peers. While the secular increase of (married) women’s employment for these countries has been well documented (Figure 1), our findings show that the trends in hours worked per employed married woman vary considerably across countries. 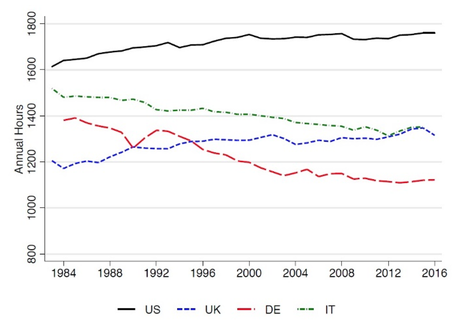 As can be seen in the top panel of Figure 2, in two of our sample countries, namely the US and the UK, hours per employed married woman increased over time, while in two other countries, Germany and Italy, they decreased. In the remaining four countries, shown in the bottom panel, trends shifted from negative to positive in the middle of our sample period. How did changes in the tax system contribute to the changes in laboursupply of married women? Can they explain the diverging evolution along the intensive margin across our sample countries? In Bick and Fuchs-Schündeln (2018) we demonstrate that to understand the cross-country differences in married couples’ hours worked in the early 2000s, it is important to take the non-linearity of labour income taxes, and especially the tax treatment of married couples, into account. Tax treatment can fundamentally differ between separate taxation, in which each spouse’s taxes depend only on their own earnings, and joint taxation, in which the earnings of the spouse is taken into account. Kaygusuz (2010) shows that the 1986 tax reform in the US, a country with joint taxation, is an important driver for the US time-series of married couples’ labour supply between 1980 and 1990 since it substantially decreased the effective marginal tax rate of married women. In our analysis, we take the full non-linearities of the labour income tax codes of each country into account. We build a quantitative model of joint household labour supply following Kaygusuz (2010), Guneret al. (2012a, 2012b), and Bick and Fuchs-Schündeln (2018). Married couples, conditional on their educational match[A1] ,optimally decide how much labour to supply to the market. They take into account not only the gender- and education-specific wages they can achieve, but also the amount of taxes they have to pay on income and consumption. We consider all non-linearities embedded in the statutory labour income tax code, especially with regard to the tax treatment of married couples. This allows us to capture the varying degrees of joint taxation that married couples face across our sample countries, as well as the impact of changes to these tax systems. Tax code complexities are captured through coding details of the statutory labour income tax codes. Our codes are based on the descriptions provided in the OECD Taxing Wages reports for all our sample countries from the early 1980s to 2016. Using the number of children as well as earnings of both spouses as inputs, our program calculates the exact amount that the household has to pay in federal, state, and local taxes, compulsory employee and employer contributions, as well as cash benefits the household receives (mostly relating to children). As an independent contribution, this user-friendly and easily integrable set of Matlab codes is available on our webpageand we hope it benefits others in their research. We calibrate the preference parameters for each country separately such that average employment rates and hours worked by married couples in 2016 are matched. Keeping the country-specific preference parameters fixed over time, we then use the country’s historical labour income tax systems and consumption tax rates, plus wages and the educational composition (i.e. the educational distribution by gender and the matching within couples), in order to obtain the predicted hours worked and employment rates of married couples for each year. Comparing the model-predicted time series of employment rates and hours worked to the actual data allows us to quantify how much of the observed changes in labour supply can be traced back to the four input factors. Finally, in order to assess the role played by income taxes in particular, we hold all inputs fixed at their 2016 level and let only taxes vary over time. The model is quite successful in predicting the time-series behaviour of hours worked per employed married woman. It not only correctly predicts the direction of long-term changes for every country in our sample, but also generates time-seriesvariation in hours worked that is highly correlated with the data. The model is thus able to capture the diverging trend patterns that we document in Figure 2. Overall, the model can generate, on average, 113% of the long-term changes in hours worked of employed married women between the early 1980s and 2016. Further analysis shows that taxes are the key driving force: taxes alone explain, on average, 81% of the long-term changes in female working hours. 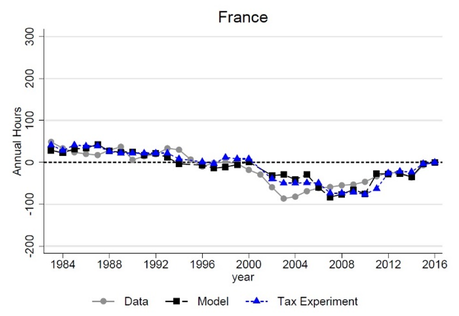 Figure 3 demonstrates the importance of taxes for three countries in our sample that (a) each represent one distinct trend pattern as emphasised above, and where (b) the model is particularly successful in explaining the observed changes in hours: the US (positive trend), Italy (negative trend), and France (changing trend). The grey line in each graph shows the hours worked per employed married woman in the respective countries (as level deviations from 2016) between the early 1980s and 2016. The black line represents the time-series predicted by the full model, letting all four input factors vary over time. The model is able to capture the different trend patterns observed in the data. The blue line reflects the model’s predictions when we let taxes vary while keeping all other inputs at their 2016 level. 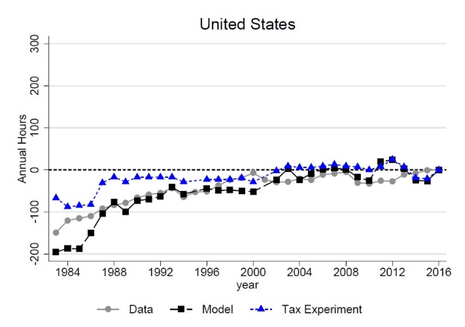 In the US, taxes alone explain around 54% of the observed increase in hours worked in the actual data. 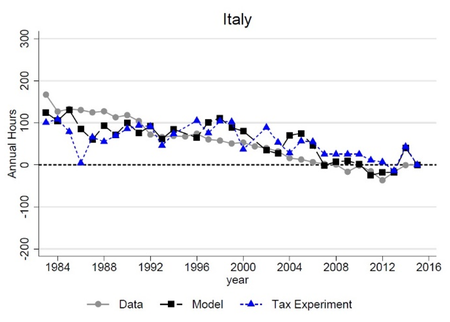 In Italy and France, the output from the tax experiment largely overlaps with the full model output, implying that almost all of the changes in hours predicted by the model are driven by taxes. The model can also account for the increase in employment rates among married women in the 1980s and early 1990s in the US and the UKbut captures only part of the secular increase in Continental Europe. 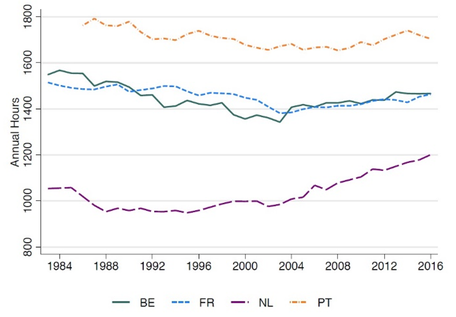 This implies that,perhaps not unexpectedly, there are other driving factors not considered in our model behind the pronounced increases in employment rates of married women in most European countries over the last three decades. The model correctly predicts the small changes in married men’s hours worked for the US, UK, France, Portugal, and Germany, but over-predicts the changes in married men’s labour supply in the three remaining countries (Belgium, the Netherlands, and Italy). While the employment rates of married women have been uniformly increasing and converging across the US and seven European countries between the early 1980s and 2016, our findings show that trends in hours worked per employed married woman vary considerably across countries. Non-linear labour income taxes are key to explaining the observed changes in married women’s hours worked per employed. Using a quantitative model of joint household labour supply, we find that they explain on average 81% of the empirical changes. The other factors considered in the model – wages, educational attainment and matching, and consumption taxes – are on average less important in generating the observed changes. As a crucial input to our model, we use the country- and year-specific full non-linear statutory labour income tax codes, which reflect in detail the tax treatment of married couples. As an independent contribution, we have published these tax codes as a user-friendly and easily integrable set of Matlab codes. Our paper shows that taxes have significant influence on the labour supply of married couples. We especially show that for married women between the early 1980s and 2016, non-linear income taxes are the key factor that shapes their hours worked, and are crucial in explaining the diverging trends in hours worked observed across countries. Bick, A, B Brüggemann, N Fuchs-Schündeln and H Paule-Paludkiewicz (2018a), “Long-term changes in married couples' labour supply and taxes: Evidence from the US and Europe since the 1980s,” NBER Working Paper 24995. Bick, A, B Brüggemann, and N Fuchs-Schündeln (2018b), “Hours Worked in Europe and the US: New Data, New Answers”, Scandinavian Journal of Economics, forthcoming. Bick, A, and N Fuchs-Schündeln (2018), “Taxation and labour supply of married couples across countries: A macroeconomic analysis”, Review of Economic Studies 85: 1543–1576. Guner, N, R Kaygusuz and G Ventura (2012a), “Taxation and household labour supply”, Review of Economic Studies 79: 1113–1149. Guner, N, R Kaygusuz, and G Ventura (2012b), “Taxing women: A macroeconomic analysis”, Journal of Monetary Economics 59: 111– 128. Kaygusuz, R (2010), “Taxes and female labour supply”, Review of Economic Dynamics 13: 725–741. McDaniel, C (2011), “Forces shaping hours worked in the OECD, 1960-2004”, American Economic Journal: Macroeconomics 3: 27–52. Ohanian, L, A Raffo and R Rogerson (2008), “Long-term changes in labour supply and taxes: Evidence from OECD countries, 1956-2004”, Journal of Monetary Economics 55: 1353–1362. Prescott, EC (2004), “Why do Americans work so much more than Europeans?”, Federal Reserve Bank of Minneapolis Quarterly Review 28: 2–13.